1. Will my vending/Dining Declining Balance/bookstore account balance carry over to the next semester? All account balances will carry over throughout your UF career, with the exception of Flex Bucks which come with the All Campus Meal Plans. 2. I am graduating/transferring/withdrawing from UF. How do I go about getting a refund from my accounts? If you are graduating, transferring to another school or withdrawing from UF, you are able to obtain a refund for any of these three accounts. In order to do this, you must submit an online request. Your refund check will be issued soon after. 3. 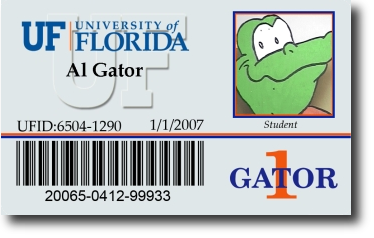 How am I able to use my Gator 1 ID card as an ATM card? If you have a Wells Fargo Everyday Checking account (or are planning on starting one), you can have this account linked to your Gator 1 ID card, so that it can be used as an ATM card. This can be done by visiting the Wells Fargo banking center located on the ground floor of the Reitz Union. If you do not already have a Wells Fargo account, but wish to open one, you can do so at the banking center in the Reitz Union, or even at a branch in your hometown. If you choose to do it outside of Gainesville, make sure to tell them that you are a University of Florida student, and to check on the Wells Fargo Everyday Checking account offered to UF students. 4. I find that I don't use the funds in one of my accounts. Can I transfer them into another one that I will use more often? If you would like to transfer the funds in one of your account to a different account (i.e., vending to declining balance) you will need to visit the Gator 1 Central office located on the 2nd floor of the UF Bookstore and Welcome Center. Here you can fill out a transfer request form, and the transfer should take place as soon as possible. Note: Only one funds transfer, at a minimum amount of five (5) dollars, and maximum amount of two hundred (200) dollars will be allowed every 120 days between different G1C accounts. 5. I added funds to my account online using a credit card, and I checked my account and saw that the money has not been added yet. What do I do? While most transactions will be reflected in your accounts immediately, there are times when this will not be the case. When this happens, it is usually caught automatically by our system on the next business day and corrected. If the money still has not been added to your account by the next day, email or call our office, and we will work to solve the issue as soon as possible. For more information please review the Gator 1 Central Card Programs Agreement Terms and Conditions or the Gator Dining FAQ's. If your question is not addressed above or in the Gator 1 Central Card Programs Agreement Terms and Conditions, send an e-mail to . This page was last updated on 5/29/2014.